You guys know that I will never promote a product that I don't truly love, so I'm super excited to be working with Lems shoes this year as one of their Brand Ambassadors! We've loved Lems for a few years now, especially since their whole motto is 'Live Easy and Minimal.' That is definitely something I can get behind! They are a small, family owned company completely run in the US. And their Mariner shoe is my go-to especially in the fall and spring and/or when I was working 12 hours days on my feet all day. 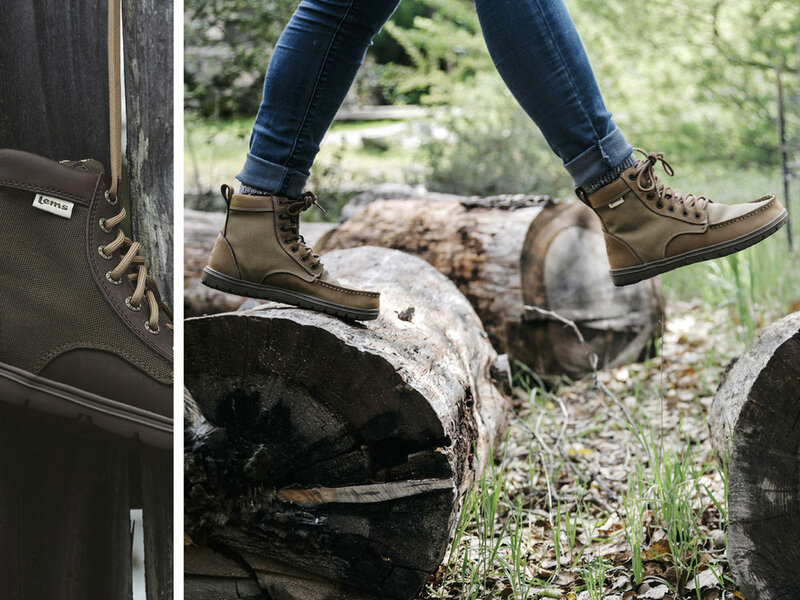 My husband wears his Boulder Boots regularly, and in all honesty, I've got my eye on a pair too... How cute would they be with leggings and a plaid shirt for hiking, outdoor adventures and even running errands?! I love pieces that work into my jog to java lifestyle, and my Lems definitely fit that bill. Lately I've been wearing the Primal 2s for my workouts and cross training, and they are so comfortable that I started wearing them out as well! (If you're interested you can find some of our workouts by following along on Instagram Stories! Click on my profile pic at the top of your feed, or go to my profile and click the profile pic to see them.) You know I love me some fun and functional workout wear, and the Primal 2s were the perfect addition. I had been wearing the Merrel Trail Glove before these, but the Primal 2s have a wider toe box which is much better for your feet. If I do any road running, I don't feel the slap of the pavement the way that I used to in other minimal running shoes. All Lems Shoes are built on a zero-drop platform. Why choose zero drop, minimal shoes? Why is this important?? Traditional footwear elevates the heel an average of 14-24mm (0.5"-1.0"), and this elevation of the heel throws off the alignment of the spine and forces an unnatural heel strike. This unnatural positioning can lead to lower back strain, foot discomfort and other issues like bunions or plantar fascitits. Lems help alleviate strain on the lower back, and make you walk with a healthier mid-foot to forefoot strike. This was something that my husband and I started researching years ago when Vibram came out with their Five Fingers, and Lems is definitely our favorite brand of minimalist shoes because of the natural shape of the toe box. They also come highly recommended by experts in this field. Here's the fun part... Lems is currently doing 20% off Feb 16-20th! And if you miss that sale they are giving all of you guys a discount with the code ASHLEY15! You get 15% off any pair of shoes. I'm eyeing the navy Boulder Boots myself... Check out their Look Book to get some ideas! I love the minimal, natural feel of it and the company in general. Note: this is not a paid post, but I am a Lems Brand Ambassador because I truly love their product. All thoughts and opinions are completely my own.